Kokila asks Meera whats the new drama, and why is Vidya crying. Vidya tells how Meera is her mum in law now. The Modis get shocked seeing Meera married to Dharam. Meera did not know about her Sautan, and she will be planning to hurt Dharam’s first wife. Gaura thinks that she has fulfilled her motive and thinks to shock Kokila with her truth. She reveals truth about her brother’s death and tells about her revengeful motive. Everyone get shocked. Kokila regrets to believe Gaura and getting her grand daughters married at Gaura’s house. Gopi gets angry, asks Meera and Vidya to leave SuryaVanshi family and come to Modi Mansion. While Vidya agrees to leave the house, but Meera prefers to stay in Gaura’s house. Sasumaa troubles Sarojini just the moment she lands up in her sasural. Sarojini is repenting to come to her sasural, and her inlaws are troubling her much. Dadi asks Sarojini to wash the clothes. Sarojini is made to do all the house hold works and everyone acts rudely with her. Dushyant asks her to walk on the hot coal and says it is a ritual to prove her purity. Sarojini hopes Somendra help her, but he is helpless. Somendra feels that it is time for Sarojini to do all the stuff. It happens as Somendra walks in her room, and Sarojini have to give agni pariksha to prove her sacredness. Her inlaws asks Somendra and Sarojini to stay apart for few days and tells it is also a ritual. Rana ji comes and sits on his Singhasan/Royal chair. Gayatri comes and sits beside him. Gayatri’s dream has been fulfilled and she became Ranaji’s Rani. She is about to get throne of a Rani, just then Britishner objects to make her Rani. Gayatri faints being very tensed. Sangeet function is going on for Rashmi’s marriage. Old generation and young generation have challenged each other. Young generation will perform on rap, DJ’s music. Naitik dances with Akshara in Rishi Kapoor’s style and dances on his hit song Tu Tu Tu Tu Tara…………….and Akshara acts like Juhi Chawla and gets shied away. There is a good comic timing and everyone enjoy the act. Akshara wears Juhi’s like clothes during her performance. All the oldies dance on Rap music and dances on Yo Yo Honey Singh song. Then they get traditional clothes and dances on desi song with dhol baaja…………. Dayan is dead in Simar’s house, but the painting frame in her house is showing its effects. There is something behind the frame and shows effects on others. It is the soul which is troubling everything. Simar calls Pandit to know the solution after getting worried about the strange things happening at her house. Pandit ji asks them to do Mata Rani’s jaap. Amar acts detective and thinks there is something wrong with Sanjana as she tries to scare them with rope. Vibhuti ji gets electric shock. Angoori asks, what happened? He got a watch, he wears it and gets electric shock. This watch will be useful for him to take revenge on Tiwari ji. Tiwari romance with his wife, and Vibhuti ji couldn’t bear it. He gets this watch to trouble him. Angoori drives the rickshaw in the lane and everyone get surprised. Sandhya is made to stand tied by metal chains. Garjana men then build walls around her, similar to Anarkali. Sandhya does not break down. Sooraj comes there and feels her presence near the same wall. Sandhya’s love is getting sacrificed as she is away from Sooraj. Sandhya gets out of breath as she can survive behind the walls for few hours. Sooraj gets sad and stands taking the wall’s support. Will he be able to save Sandhya? RV and Ishani got engaged and then a new twist comes. Amba’s brother wants to tell Ishani about Ranvir’s childhood secret. Amba hears them and stops him. She asks what is he telling Ishani. He says I was just blessing Ishani bahu. Amba asks him to go and rest in his room. Ishani does not know about the secret and now she will try to find out about the big incident happened with Ranvir. Viplav is in love with Dhaani and the consequences are to be undergone by Dhaani. Dhaani’s mum Dulaari beats Dhaani seeing her with Viplav at the temple. Nani stops Dulaari. Dhaani was just praying in the temple, when Viplav comes to talk to her. He apologizes to her and a new misunderstanding gets created. Kanak has already humiliated and beaten Dhaani in the market. Now, its Dulaari’s turn to beat up Dhaani to get her anger out. Viplav asks Dulaari to listen to him. He finds its not right time to confess love to Dhaani at this time. Dhaani is helpless and shattered. 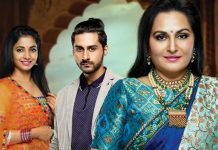 Dadi has created the misunderstanding, Kaushalya is possessive about Shivam and scolds Riya for breaking the Teej fast. Raghav asks whats happening, that Riya is crying here and Kaushalya is going against her bahu. He says breaking fast is not big problem. Kaushalya says Shanti has saved Shivam from falling off stairs, and does not know Shanti has put oil on the stairs to make Kaushalya and Riya against each other. Shanti asks Kaushalya to beat Riya for beating the fast and gives a big stick. Kaushalya refuses and Riya worriedly cries. Shanti and Sarla create a big issue out of this matter and side with Riya to make her against Kaushalya. Kaushalya cries and shuts the door. Shivam and Riya ask her to open the room. Kaushalya is hurt that Shivam has asked her a question to defend Riya infront of all the guests. Kaushalya says Shivam has taken Riya’s side and said she is wrong. Maharana Pratap will be marrying Phool Kanwal. She is the childhood friend of Ajabde and Pratap. Ajabde decides to get Pratap married to Phool so that Phool does not commit suicide. Ajabde sacrifices her love and shows a big heart according to the circumstances. Ajabde did not have any other option, and convinced Pratap for marriage. Pratap and Phool get married by all rituals in grand style, and take blessings from elders. Check here for shows missed in this post…. Thanks for the spoiler of sarojini. Spoiler for badtameez dil and qubool hai and piya rangrezz. Please confess Viplab your love to Dhani. Why no Reporters & Badtameez Dil Spoilers? post for piya rangraezz pls….